On the first wall, before actually getting into the exhibition, was a small picture, perhaps an old postcard, of a building falling down with an inscription at the bottom reading, "It's a great life if you don't weaken." The image is one thing, the legend another, the conundrum is the same. One and two. And so it was throughout the show. Everything structured, in sequence, hopeful; hopeful, that is, that the structure and the sequence will continue, knowing they won't, at least not together. Washington Cathedral has two grids of old colorized postcards of the world's sixth largest Gothic cathedral, begun in 1907, as it might have been completed (though it wasn't until 1990). They are quite beautiful in the varieties of light they emit, like a mosaic. The last space in each of the grids, in the lower right-hand corner, is left blank, as if for what actually happened, though for it to be in sequence the new card would have to be faked in the technology of the old cards--another kind of lie conflating future and past. Time is also strangely compressed in Palindrome, which lines up five front pages of British and Dutch newspapers from February 20, 2002 (or the palindromic 20.02 2002 in the European shorthand for date). Each of these pages in the simple grid of five has a grid within it for pictures and texts, different from the other five, meant to impress the news on individual readers of events that took place the day before, in other words, the newspapers have influenced people in one moment of time with things that happened in previous moments of time, and now we are looking at what they might have been impressed by, or not caring at all but simply looking at the patterns, the art, which is all we can do anyway because our information is now so cut off from its origins. Whatever it was was important, and the grids and palindrome hold that in suspension. The numbers 20.02 2002 derive, in fact, from numbers that the wonderful Belgian conceptual artist Marcel Broodthaers (1924-1976) had stenciled on a wall of his studio in Düsseldorf. 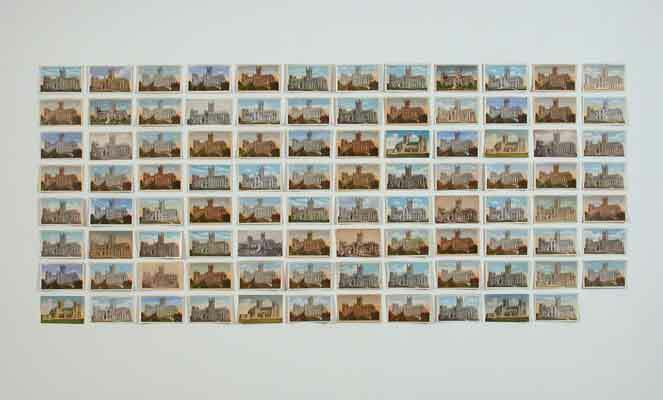 Dean's Chère petite soeur is based on a Broodthaers film of a postcard he found that shows a boat in a storm. The film combines positive and negative versions of the same image and uses the salutation and text as title and subtitles. Dean names the boat Chère petite soeur and transforms the scene into a sequence of two scenes drawn in chalk on two enormous grids of blackboards, with the boat going down in the right half of the diptych as in a storyboard for a film. One and two; there are no other possibilities. Is three that the boat would go down even farther, or that it would come up again? Those are only possible refinements. The tragedy occurs despite the structure, but is also suspended by the structure, the boat itself being a structure, like the cathedral and the newspapers, that makes its way, or not, through adversity. Then there is a 13-minute 16mm movie Dean made in Broodthaers' Düsseldorf studio and called Section Cinema, 2002 after Broodthaers' name for his imaginary museum. 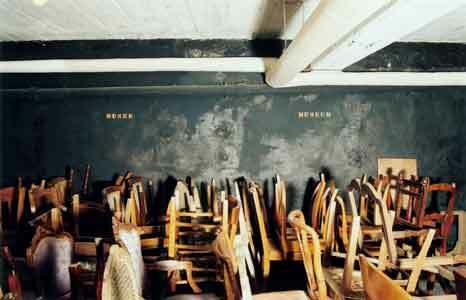 It is a sequence of several-second shots of walls and corners of the windowless basement interior in which the only remains of Broodthaers are his stenciled signs for his demonstration of the world: the numbers 0, 1, 2, 4, and 12; Fig. 1, Fig. 2, Fig. 4; the words "Silence", "Museum", "Musée". A lightbulb in one take is like the sun of this solar system. But there are ship models here too, which Broodthaers no doubt would have liked, and furniture being stored by a local museum. Courtesy of the artist and Marian Goodman Gallery, New York. 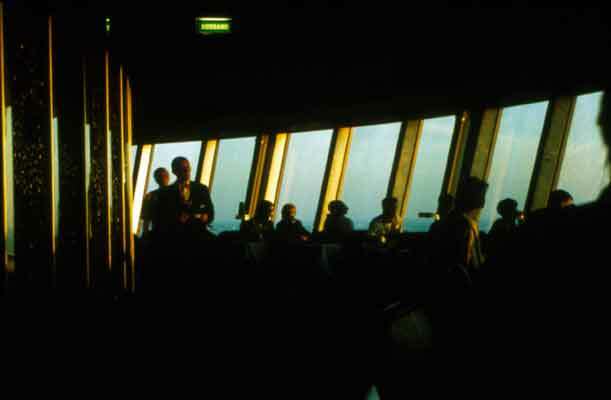 The film continues in a loop, as does another film, called Fernsehturm, shown in another space, which takes place over 44 minutes inside the restaurant of the famous TV Tower erected near the Alexanderplatz in eastern Berlin in 1969. It is only barely perceptible that the restaurant itself revolves within the spherical shape elevated high above the city, and that the view keeps changing for the patrons seated so satisfyingly at tables around the outer edge. But we see the outside only vaguely, and only from the inside in panoramic shots usually set up to take in several tables and the slanted structure of the windows, then moving occasionally to waiters in their routines, a performer playing an inane tune on an electronic organ, individual groups of people at their tables. It is difficult to make out faces or words, but there is a general din of voices, clatter of dishes, and background of generic music. Though the film shows continuously, there is a beginning, when a waitress sets the tables, and an end, when the same waitress clears the tables. There is daylight at first, then sunset, as the interior gets darker, then night, and finally closing time, when the interior lights come up and the patrons leave, all as the restaurant slowly turns. The restaurant is a structure, like a ship, a cathedral, or a museum, that accommodates human desire and passage. The experience is a completely familiar European one in all its details of movement, sequence, interchange, and gesture. The gathering of people is warm and comforting, not particularly alienating. Nothing surprising or out of the ordinary happens; the schedule is followed. The space goes around and returns to its past. Yet the restaurant is totally divorced from its surroundings (which only vaguely exist through the windows), raised up high into the air above the earth just as Broodthaers' studio is lowered into the earth. The tower represents a curious, contradictory sense of community in a "socialist" society of the later 20th century extended into the 21st century, just as the Washington Cathedral represents a contradictory sense of community in a "democratic" society of the early 20th century, extending from the 13th century. Both are fortresses against the trepidations of history. The exhibition appeared at Marian Goodman Gallery, 24 West 57th Street, New York, NY 10019.